One of our favorite activities was the Alpine Slide, Colorado's longest. This slide is made of narrow concrete "tubes" with 90-degree sides and offer a choice of beginner or moderate runs. At over 3,000 feet long, the heart-pounding double tracks zig-zag their way down the mountain . At first, you have to concentrate on the speed, which is easily adjusted with a handle, so there's no opportunity to enjoy the scenery. But you can definitely take a look around you while on the Arrow chairlift ride up to the start of the run, where the slide vehicles await. At first, most people are hesitant to go very fast. When we saw children as young as 10 years old taking their racer down the tube, we relaxed. Younger children can ride with their parents. You won't want to miss this ride, and chances are once will not be enough. Everyone will want to take a scenic ski-lift ride to the top of the mountain. 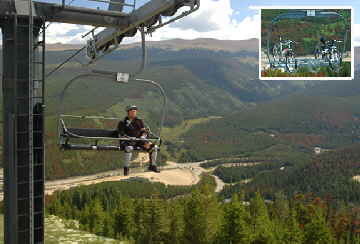 The Zephyr Express chairlift whisks you from the Village at Winter Park's base up to the summit of Winter Park Mountain which lies at an elevation of 10,700 feet. The ride offers spectacular views of the Continental Divide and the Fraser Valley. And at the top, The Lodge at Sunspot offers mountaintop dining including lunch and snacks. The lifts that hold snow skis in the winter change to lifts that hold mountain bikes in the summer. Virtually every person riding the lift was accompanied by a mountain bike. At the top, a variety of trails -- from beginner to very experienced -- were easy to follow. If you did not want to bike, an easy walking trail winds down the slope to the bottom. Hiking shoes are recommended. An interesting 18 hole disc (Frisbee) golf course starts from the restaurant at the top of the mountain and works its way across ski trails and down the mountain. There is no charge to play the course, but there is a fee to ride the Zephyr Express chairlift and to rent discs, if needed. You'll have the beautiful views of the Continental Divide for distraction. This destination is definitely a mountain bike paradise. The majority of summer visitors to the summit were paired with mountain bikes. 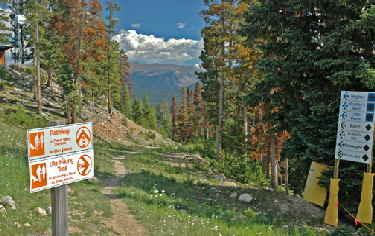 The Winter Park area offers some of the most spectacular riding in the western U.S. Whether you're a novice or an expert, plenty of trails exist for you to experience. With over 600 miles of trails throughout the Winter Park and Fraser areas, it's no wonder Winter Park has been dubbed Mountain Bike Capital USA. Casual bikers can cruise easier trails throughout the community and around the quaint town of Winter Park. 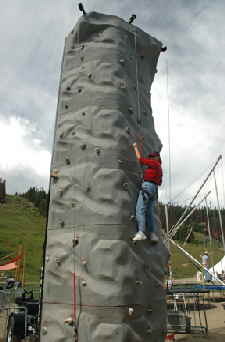 At the base in Winter Park Village, you'll find a fun outdoor Climbing Wall. Test your climbing skills on beginning, intermediate and advanced walls. Located between the Leaps and Bounds Bungee and the Alpine Slide, this activity certainly will challenge your strength and endurance in the high-altitude air. The Leaps & Bounds Bungee is enjoyed by both kids and adults. The family can try the four individual trampolines linked by one center tower. Flips and twists are easy to perform on these trampolines with the help of the bungee cord. The whole family can enjoy the Mountainside 18-hole miniature golf course, where each of the eighteen holes depict historic aspects of the Fraser Valley. A fun human maze twists and turns in every direction. Finding four check points and racing against the clock adds an extra dimension of challenge to the frequently re-configured labyrinth. For those who don't get dizzy, try the GyroXtreme. It's like floating in space. The GyroXtreme is similar to the equipment designed by NASA for astronaut training, and used by many air forces to train their fighter pilots. More importantly, it offers plenty of fun for kids of all ages, and should not be missed. We passed on that one. Winter Park has many summertime weekend events such as the Family Plaza Palooza. Visitors can enjoy free family entertainment with face painters, character artists, balloon art and jugglers at that event. For information and details on all their activities and events, visit their website at http://www.skiwinterpark.com/todo/resortactivities/summer_activities/index.htm or call (303) 316-1564. We obtained an unlimited day pass for the Resort and it was well worth it. For one price, you are able to enjoy all the activities unlimited times. The Zephyr Mountain Lodge is located at the base of all the activities and the new Village at Winter Park is under construction. The Village will include additional accommodations, shops, marketplace and live entertainment options. Accommodations throughout Winter Park are numerous and new condo units are being built throughout the Winter Park community. Timeshares are among the most popular types of condo units to be purchased or rented in Winter Park as they offer guests a lower price tag and allow them to visit in the season of their choice. The array of amenities guests will enjoy while staying at a Winter Park timeshare include indoor pools, saunas, on-site skiing, private balconies and spacious accommodations. We stayed at the convenient and friendly Beaver Village Condominiums, phone (800)824-8438 or visit www .beavercondos.com. Although it had a fully furnished kitchen, we ignored it in favor of several restaurants. And even though our visit was in the summer (end of August) the mornings were a chilly 45 degrees, so we did enjoy the gas-fired fireplace several times. By mid-morning, we were shedding our jackets in 79-degree weather. 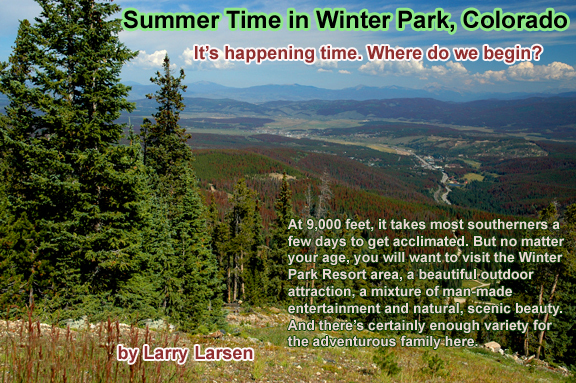 For local event information, maps and trail recommendations, call 800-903-7275 or visit their website at www.winterparkresort.com. The Winter Park / Fraser Valley Visitor's Center is located on Hwy 40 in downtown Winter Park. Adjacent the chamber of commerce is an interesting park that has several inclines for bikers, roller-bladers and skate boarders. From it, there is a great walking trail along a small creek that meanders through the woods in the middle of town.